Aloha Bear is a beautifully made condo in a very exclusive property with many upgrades, only 2 minutes from the lifts. You enter the main floor of the condo from your private 2 car garage on the same level as the main floor. No hauling ski equipment, luggage or groceries up & down common stairs or in the snow. Downstairs is a second bedroom and bath, great for the kids or another couple. We went out of way to make our little retreat comfortable. It is called Aloha Bear for Hawaiian hospitality and bears which personify strength and go with the flow of the seasons. We have a full kitchen with many amenities including an espresso maker & Hawaiian coffee. Aloha Bear also has a rice cooker & chop sticks for our fellow rice eaters. The extras: The bedrooms have great beds and linens to make your sleeping a pleasure. The living room has 3 recliners, a gas fire place and a 50 inch LCD HD TV and cool unique handmade furniture so you can relax after a fun day on the slopes in the winter or day trips to the monuments & festivals in the summer. The master bedroom has a beautiful Southwest king size bedroom set with a CD IPod docking station and a jetted tub in the bathroom. The downstairs bedroom has a full and twin bunk bed with a 32 inch LCD HD TV and its own full bathroom. Full sized front loading washer and dryer add to your convenience. Lots of plates, glasses, wine glasses, & cooking utensils including a good selection of pots and pans, baking pans for muffins, cakes etc. A nice, fairly quiet dishwasher. Water and ice through the door. Skiing & sight seeing: Coming from Hawaii, we love being tourists on the mainland. We like the Southwest history, native people culture and fabulous geology. Though we have enjoyed skiing many places, we fell for Brian Head because the snow was great whenever we went there (including the marginal times), skiing was great for families; lots of choices for those who don’t ski all that often as well some challenging stuff for those adventurous types, a mellow vibe, friendly people, the boarders respectful, the lift tickets are affordable and to top it off it is in Utah's 'color country' and only 3 hours from Las Vegas. What we didn't realize was how great it was in the summer. Cedar Breaks Monument is only about 5 minutes away by car in summer. It is a spectacular photographers dream with ranger lead snow shoe walks along the rim in June (snow dependent). Other monuments within day trip range are Zion, Kolab Canyons, & Parowan Gap. The Shakespeare Festival in Cedar City is a real treat in an intimate outdoor theater. Summer sports: Cedar City is becoming known for its cultural appreciation of the performing arts in theater and music with lots of fun festivals. On the Solstice, the Parowan Gap, only a half hour away, celebrates one of the only known natural solstice and celestial landmarks, long recognized by native peoples traveling though this area who left hundreds of fantastic petroglyphs. Brian Head becomes a mountain bike, hike, & ATV destination in the summer with really nice lakes for fishing close by. 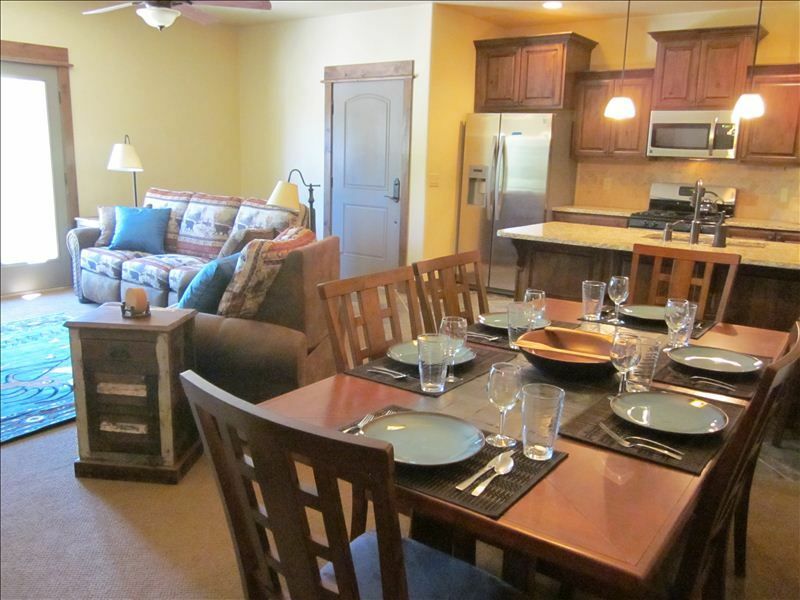 A stay at Aloha Bear, is a bit of an upgrade from the usual ski condos. You will feel pampered and relaxed. The kids can have their own space downstairs or you can enjoy quality family time all together in the comfy living room. In the winter, it is so easy to get from the living room to the lifts and back again. In the summer, it is such a cool comfortable retreat from sight seeing in the desert or surrounding mountains. We have cable and private WiFi, no phone though. Note: This is not a condo to cram a bunch of people into. We live on Kauai in paradise so we have to have something special to go to, hence Aloha Bear. I rent our family's properties as vacation rentals in Hanalei. We enjoy the city Vegas rush for a night or so after flying from rural Kauai, then enough of that and back to nature in the mountains. We have skied all over the place. We really like the laid back vibe at Brian Head. The property was new, cool looking & in a great location close to both lifts, not far off the main road so good for driving out in the snow but not on the main road so nice and quiet. WE LOVE the private two car garage on the same level as the main floor. The private two car garage on the same level as the main floor is very unique compared to any other ski condos in Brian Head. No schlepping equipment! Hawaiian coffee in the freezer :o) Cool books on the South West and geology and Native peoples. From the balcony & both bedroom windows you have a great view of the aspens & pines. A peak of the main ski mountain from the balcony. Views of trees in the near distance from the bedrooms and living room. Forced air plus fire place blower plus separate heater in downstairs bedroom. Wonderful high thread count bedding and bath towels provided for your comfort. Glass front gas fire place to take the chill off and gladden the vibes. Two car private garage on same level as main floor and master bedroom. 2 car garage with remote and key pad entry. Inside door leads into main floor of your condo. Private wireless wifi or you can plug in. If you are plugging in you need to bring a cord. Nice comfy mountain upholstered couch with 2 recliners built-in and a separate reclining chair. Pretty view & nice light from balcony. Side by side refrigerator with water and ice through the door. Big enough for big turkey dinner! Usually spices, oil, vinegar, some condiments, etc. Lots of counter space, all major appliances and most small ones including coffee maker, rice cooker, and espresso machine. Nice dining area with mirror reflecting the snow or sun out on the balcony. Flat screens, one in the living room and one in the downstairs bedroom. Cable TV. Flat screens in living and downstairs bedroom. ipad doc in master bed room. Speakers in living room to run off a computer or other device from headphone jack. Books on the Southwest, a full Louis L'amour collection. Espresso maker and Hawaiian coffee & a very complete kitchen & kitchen ware. Living room has 3 recliners, on both ends of the couch and a separate recliner, gas fire place, french doors to small balcony, and a desk for writing or computer area with a recharging station. Gas fire place in living room. The main floor is easy access from the car straight in from the garage so it should be easy for older folks. Decorated with geological & native american artifacts and photos of Native people's archaeological sites of the Southwest. Loved every minute in Aloha Bear! Great for our family of four. Everything was wonderful. Thank you so much! Nice clean condo, very well stocked and a great location. We appreciate our guests taking time to leave a nice comment. We do try to keep the house well stocked. Once up on the mountain it is nice not to have to leave to get some little housekeeping item. Most of our guests appreciate this and replace what they take the last of. We were just there last week and had a blast and enjoyed skiing. Beautiful condo and great location. Everything you need to enjoy your stay. We enjoyed are stay and will most definitely be coming back to stay again. Perfect fit for our family of four! This condo was a perfect fit for myself, my husband and our two young children. We have stayed in the White Bear condos before, but I have to say having the garage attached directly to the condo is priceless, especially with young kids. It wasn't even very cold outside yet so I can see how this would be a HUGE benefit in the winter for unloading and loading. Having both the upstairs and downstairs space was great and the kids really enjoyed having their own area to play and sleep. We had everything we needed in the well-stocked kitchen to cook meals and the Hawaiian coffee was a very nice touch! While we were there we enjoyed day trips to Parowan Gap to see the dinosaur tracks and petroglyphs and also to Cedar Breaks which was breathtaking. In the condo we played some of the games they had available and the kids enjoyed some new cartoons in the morning on cable. One evening we also enjoyed a great dinner at the Grand Lodge. It was a very fun weekend and we will definitely be back! Thank you for letting us enjoy your beautiful condo! Our family stayed at Aloha Bear over the July 4th weekend. The condo was located within walking distance of the town fair, Giant Steps Lift, and General Store. The 2 car garage was very convenient - we took our Polaris RZR with us and parked it in the garage at night. There was plenty of parking out front for our trailer and truck. Beds were very comfy, linens were fresh, & kitchen had all of the pots and pans we needed to cook. We will be back again!! We come to Brian Head A lot and usually stay in Giant steps, but we found this condo and it was a really great place to stay easy to get to slopes. It is a newer condo so looks great and the amenities are all up dated. Ver cozy and in a great area to take walks and the views are wonderful. Highly recommend it. We are about .1 mile from both the ski lodges (Giant Steps and Navajo) and the main lifts for both mountains. We are within .5 miles of all the restaurants in Brian Head. We are very close to the main road, on the right hand side of Ridgeview Street immediately after Pine Tree Way in the new White Bear Condominiums. Cedar Breaks Monument is about 5 minutes away. Zion and Kolob Canyons are about 1 hour away. Bryce is about 1.25 hours. The Parowan Petroglyphs are about 20 minutes away. Live theater and awesome Shakespearian Theater and Festival in Cedar are a half hours away.